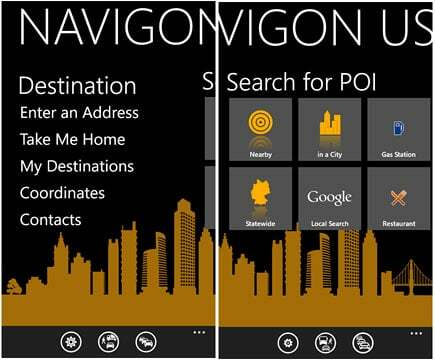 NAVIGON hit the Windows Phone Marketplace a few days ago with mixed reactions. Some felt the navigational app was a really nice addition to the Marketplace while others were hesitant on the price. Some felt that having an option to download specific maps might help take the bite out of the hefty price tag. Speaking of which, let me break the news to you right out of the gate in case you've missed it. The $29.99 price tag for the U.S. version of NAVIGON is an introductory price. After November 15, 2011 the price jumps up to $49.99. European introductory pricing is set at 59.49 Euros until November 15th and then the price jumps to 84.99 Euros. With the price being amongst the highest for a Windows Phone app, it's natural to ask "Is it worth it?". Especially when lower priced alternatives are out there that can navigate you around town pretty darn well in their own right. Over the past few days, we took NAVIGON out for a test drive and ease on past the break to see how things measured up. See if that $29.99 (soon to be $49.99) is a deal or a steal. NAVIGON is laid out nicely with one page of options to set your destination, a handful of tiles to find Points of Interest and More Page. The Destination Page has options to search for travel destinations by address, from your My Destinations page (recent points and favorites), by GPS coordinates, from your People Hub (contacts), and a Take Me Home choice that routes you to whatever address you save as home. One nice feature on entering the destination address is that the entry is broken down in sections. You first choose the State, then the City, then the Street, and then the number or intersection. I like this better than one long entry because it seems easier to navigate around plus you have predictive text to help you along as well. The only thing missing is voice entry (hint, hint). The Points of Interest tiles offers you eight ways to search for a POI. You can search by what's nearby, what's in your city, what's available Statewide, search by Google, and then by three types of points of interest (gas station, parking, and restaurant). These three tiles are customizable (more on this in a second). You also have a neat little feature called the Reality Scanner. The Reality Scanner uses your Windows Phone camera and GPS coordinates to give you a real world view of your surroundings and provide an instant identification of what points of interest are in your immediate area. Hard to comment on this feature because I could never get it to work. I kept getting "No POI's in the area". Which leads me to one missing feature, a Help Section. Your More Page offers you options to view the map, get your GPS information and view the Points of Interest settings. The POI settings allows you to customize the three POI Search tiles. From the "three-dot" menu on the main pages you can find information about NAVIGON (but no help section) and a DirectHelp feature. DirectHelp pulls up gas, law enforcement, hospital and pharmacy services in your immediate area. Tap on the type of service you need and a list of what's available is pulled up for mapping as well as contact numbers. DirectHelp also provides your current GPS Coordinates as reference. Also down below you will find buttons to access settings, your route profile, and traffic information. You'll have other buttons appear here and there throughout NAVIGON but these three are the more consistently present control. General options: These cover language, voice styles, distant units, etc..
Navigation options: These deal with how the map is displayed and speed limit settings. Red Light Camera Warnings or Safety Camera: More and more municipalities are installing Red Light Cameras. These are the cameras that are triggered when someone runs a red light. Such a Polaroid moment results in a costly traffic citation being issued. The Red Light Camera Warning, when turned on, will alert you (the lovely female voice says "caution") of known intersections that have such cameras. Traffic Options: Basically two options on how you want traffic data used and how you want traffic events announced based on travel time loss. Optimize Traffic Option: NAVIGON uses Floating Car Data to help determine traffic flows. Basically, when turned on, your Windows Phone sends anonymous data to the NAVIGON servers about your travels. The computers then disect this information to determine areas of congestion, smooth travels, and other information that can be used to create alternative routes. Your Route Profile button takes you to another group of settings used to determine your route calculations. These settings include how you are traveling (car, truck, foot, etc. ), what type of route you prefer (fastest, shortest, scenic, etc. ), and avoidance settings for highways, toll roads, and ferries. The Traffic Information button will pull up any traffic flow issues (congestion, construction, accidents) that are in your area. The information also includes events that are well out of your area that will be used to calculate long distance routes. I was a little underwhelmed with the map view for NAVIGON. You have the option to view things 3D or 2D but the colors are a little on the drab side. It may be a case that I've grown accustom to the brighter BING maps that NAVIGON looks a little on the gloomy side. The map is touch navigable and points of interest icon are scattered about, bringing a little color to things. There isn't a satellite view but the map does support landscape viewing both in the navigation and open map view. From the map view, you will see a compass arrow in the lower left hand corner, button controls to access settings and your route profile. The "three-dot" menu pulls up options to view your GPS information and access the Reality Scanner. Up top you'll see your speed and direction of travel displayed and below you will see the name of the road you're on displayed. When you choose your destination, NAVIGON will generate three possible routes. A map will be displayed with three options beneath it. The first is the route NAVIGON recommends and the others are alternates. Once you tap on one of the three boxes, your route is generated and displayed. Once you set your route, up top will show your speed, distance to your destination, and estimated time of arrival. A box will appear in the lower left to indicate the distance to your next turn and a button control for volume will be added to the button control bar. Your three-dot menu will give you options to view the GPS info, Points of Interest on the route, a block display (not sure what this does) and skip next destination for multiple destination routes. There is no "end route" command with NAVIGON. Simply hit the back button to return to the Main Pages and the routing is cancelled. One really nice feature with NAVIGON is the ability to pin Live Tile shortcuts for your destinations on your Start Screen. When you find a POI that interests you, the screen will display the address information that includes a telephone number and website (when available) plus a thumbnail map of the location. On this screen you will have four button controls. One to cancel the selection, one to save it as a favorite, one to access your Route Profile, and one to initiate navigation. From the "three-dot" menu you will find options to save and pin the POI to your Start Screen and send the destination via text or email. When you pin the POI to your Start Screen, you get a Live Tile that displays a customized name of the destination on one side and a thumbnail map on the other. In tapping the Live Tile, you are sent directly to the POI Screen. 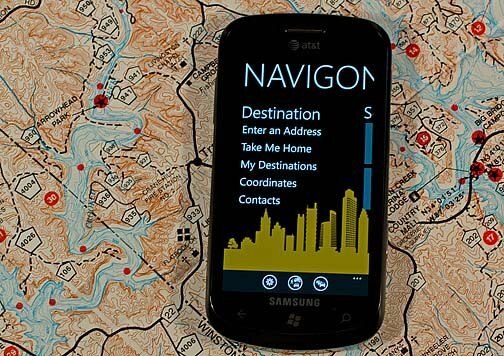 One of the key features of NAVIGON is that all your maps are downloaded to your Windows Phones. Even those maps you'll never, ever use. This eliminates the need for a data connection to load maps or create routes. In theory this is a tremendous advantage over other navigation apps when you hit weak data signal areas in your travels. The downside of all this is that it takes up a tremendous amount of space on your Windows Phone. The U.S. version requires 1.6GB of storage while the European version requires 2.3GB of storage. I have to agree with some of the early comments about NAVIGON in that it would have been nice to have the option to purchase or install certain maps to minimize storage space needs and possibly reduce costs. The odds of me traveling outside the Southeastern United States isn't good and it would have been nice have had the option to purchase only that region of maps. In Europe, if your travels are similarly restricted why do you need to download all 2.3GB of maps? I think NAVIGON hit the nail on the head by having the maps downloaded to your Windows Phone but missed the boat by not having any flexibility in which maps are loaded. With regards to performance, having the maps on board helps tremendously. Routes were calculated and re-calculated quickly and maps kept up with your travels nicely. In this respect, NAVIGON performed on par with my stand alone TomTom unit. Voice directions were clear and understandable and the map transitioned from the map view to exit details nicely. 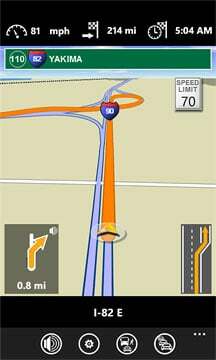 The turn by turn directions includes directional references (when available) for exits. For example, when told to take the exit to US 280 East the direction included the town of Sylacauga as a reference. Sometimes it's easier to pick up on a city name on the exit sign than the road number plus this confirms you are headed in the right direction. Someone asked about how well NAVIGON ran in the background. It runs very nicely. NAVIGON takes a few seconds to resume but picks up your travels nicely. I would turn the Windows Phone off, drive a few hundred yards, wake the phone up and my position adjusted to my travels when NAVIGON resumed. At first I was concerned that when you resume NAVIGON through the task manager or turn the phone back on there was about a two second delay. Not sure what this delay is but my guess it is the GPS confirming your current position. There are plenty of navigation apps on the Marketplace but I am mostly familiar with two, Garmin Streetpilot and Turn by Turn Navigation. I could spend all day comparing NAVIGON to others but I'll stick to these two apps because of familiarity. NAVIGON's on board maps is a major advantage. Garmin Streetpilot does download a large portion of the map to minimize your data use and Turn by Turn also has a similar feature. Turn by Turn also has the option to download portions of maps to further minimize data dependency. I liked Turn by Turn's download feature but it felt cumbersome. Even with Garmin's ability to download larger portions of the map and Turn by Turn's user defined downloadable maps, route calculation and re-calculation was noticeably quicker on NAVIGON. I don't know if it's better software or having to tap into the off-site maps to create routes but NAVIGON calculated the three routing options faster and re-calculated routes almost the second you strayed from your original course. One more advantage of having the maps installed on your Windows Phone is power consumption. NAVIGON was noticeably more friendly to my battery than the other navigation apps because it wasn't constantly downloading maps. You'll still need a travel charger for longer trips but for the shorter (within an hour) trips, you can survive without. I have to admit I like the overall appearance of Streetpilot better and the map layout of Turn by Turn better. But that's really a subjective measure and your views may vary. I did find the layout and appearance of NAVIGON begin to grow on me the more I used the app. Garmin StreetPilot seems to spread things out more on the main pages than NAVIGON which results in less drilling down. Garmin also has flight status information and seems to keep the traffic information more localized. Turn by Turn is more of a "down and dirty" navigation app that lacks the multi-page hub StreetPilot and NAVIGON offers. Turn by Turn lays everything out from the map view and does so rather nicely. I am inclined to give Turn by Turn the nod for the better map view. NAVIGON's information is a little on the small side while Turn by Turn uses a larger display for Speed, ETA, and Distance. So which is better? It's really hard to say one is better than the other (all are rather good navigation apps) but rather each fits a particular set of need. 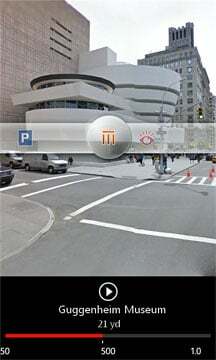 If you find yourself in need of a GPS app on occasion, look at one of the lower priced GPS apps such as Turn by Turn. If you have the need for a GPS app on a daily basis and rarely find yourself in a weak reception area, Garmin StreetPilot will do rather nicely. If you do frequent poor reception areas or don't have the patience for data to update maps or routes, NAVIGON will be hard to beat. We'll keep an eye on Turn by Turn's update to see how that app's new download feature changes things. If the new version gives users more flexibility in which maps are downloaded and the app performs just as nice as NAVIGON, the choice will be harder to make. It will be interesting to see how the new offline map feature will change things with Turn by Turn. The new version sound as if it could hold its own against NAVIGON but I think the key will be how the installed maps impacts route calculation. We'll keep an eye out for the new version of Turn by Turn and let you know how it shakes out. There's little doubt in my mind that NAVIGON is a quality navigation app for your Windows Phone. It is the first navigation app that has me seriously considering getting rid of my TomTom unit. NAVIGON is laid out nicely, has a healthy amount of features, and you can't ignore the benefit of having all your maps loaded on to your phone. I think where NAVIGON falls short is the price and inability to allow users to choose their maps. How far of a fall is going to be up to you guys. The introductory price of NAVIGON is competitive and for what you are getting, it may be a steal. However, once November 15th rolls around and the price explodes to $49.99 the choice becomes more difficult to make. But consider this. A stand-alone GPS unit like my TomTom will run well over $100 (sure you can probably buy last years model for a little less). NAVIGON performs close enough to these devices that many will argue it's just as good. So for about $50 less, you can have the functionality of a stand alone GPS unit with one less device to plug into your cigarette lighter. One more thought on the pricing point. The iOS and Android versions of NAVIGON are running $59.99 so the Windows Phone version is a bit less in cost. The iOS version does have a regional map version for the U.S. that runs $29.99 so it is entirely possible we may see that on down the line. Regardless, if you rely on GPS navigation, for what you get and how well NAVIGON performs, $49.99 isn't a bad price. Could it be better? Sure. But what out there doesn't have room for improvement? NAVIGON really needs to re-evaluate how it markets this app. Especially with regards to how it offers the maps. Not everyone will need every map in the U.S. or European versions and not everyone will have the storage space for the full compliment of maps. Some may opt for Garmin to avoid deleting/reducing their gaming or music library simply to make room for maps they will never use. If the new version of Turn by Turn Navigation has options for which maps you download, that may turn some heads away from NAVIGON as well. I think NAVIGON would have been better received if the shell was sold for $3.99 and maps were available for individual or regional downloads at a respective price. Heck, if they can offer regional versions over at iOS, why can't they do it here? If pricing and map flexibility isn't an issue, you will be very pleased with NAVIGON. 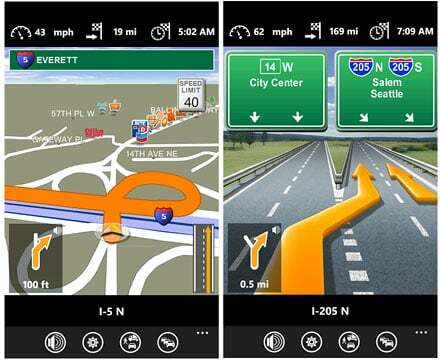 It joins a growing selection of GPS navigation apps that are available for your Windows Phone making the choice a little more difficult to make. If you are going to go with NAVIGON, I'd strongly recommend doing so before the introductory price expires. For me, I see NAVIGON performing just as good as the TomTom unit sitting on my dash board. I'm not ready to give up my TomTom but I do see myself using it less. Unfortunately, there isn't a trial version available for NAVIGON. Hopefully that might change (remember StreetPilot was initially released without a trial version) and for now the U.S. Version of NAVIGON is running $29.99 (goes up to $49.99 after 11/15) and the European Version is running 59.49 Euros (goes up to 84.99 Euros after 11/15). You can find the U.S. version here at the Windows Phone Marketplace and the European version here.